11/21/07, The Dakota: He's not doing solo shows anywhere else in the country, but he'll do one for us; he's been here before and he likes this place. Club owner Lowell Pickett calls him "precious." Debbie Duncan sings "Happy Birthday" to him (it is his birthday). Then Mac Rebennack, a.k.a. 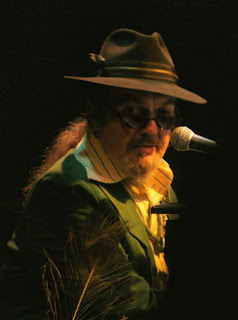 Dr. John, reaches out and pulls us close with his big, dense blues and boogie piano, gravelly voice, and one-of-a-kind, good-times takes on old familiar songs; in his words, "I always like to mess it up." From "Shoo Fly" he moves to "Fever" ("You put your arms, around me, I'm gonna hit you with a rockin' chair...You give me pneumonia"), "Shake It for Me," "Big Chief," "Tipitina," "Sing Sing Sing," "How Come My Dog Don't Bark (When You Come Around)," "Dorothy" (written for his mother), "Ramble," "Mardi Gras Days," and more; it's a generous set. He takes requests and obliges. In between, he regales us with stories, which can sometimes be hard to understand because he speaks his own language and forgets to enunciate. The curtain is open, the house is full, but it's all very intimate and personal, one of those moments that happen in live music (and only in live music) when you feel as if an artist is performing just for you. During his encore, he invites "all you low-down politicians" to "chew my drawers." Speaking of drawers, you can go to Dr. John's Web site and order some officially authorized boxer shorts.